2017 represented the seventh consecutive year of turnover growth for Irish hotels. Profit levels are higher across all regions, recording an increase of 12.5pc year-on-year. Midlands and East region continues to be highest turnover-generating region per available room (€81,913 in 2017). 9.9m visitors travelled to Ireland in 2017, a record high and a 3.6pc increase on 2016 – the previous record year. Profits growth are the highest in the South West region, an increase of 17.4pc year-on-year, while Dublin saw the lowest levels of growth in profits, at 12pc. Dublin’s average room rates have stabilised and are now growing at a slower pace. Irish hotels have enjoyed a seventh year of growth in turnover with record profit levels, room occupancy levels and average room rates recorded across the nationwide. The figures are contained in the 23rd edition of the Crowe Ireland Hotel Survey. Accountancy firm Crowe, formerly known as Crowe Horwath, who are advisers to the hotel sector, said the levels of profitability recorded are necessary to allow for a €1.5bn investment needed to deliver an additional 11,000 rooms which are required within the next seven years. Crowe warned that “failure to deliver this capacity will impact on competitiveness and Ireland’s ability to maximise revenue from the tourism sector”. Hotel room rates rose in all regions, up 6.9pc last year when compared with 2016. Rooms in Dublin hotels had an average rate of €136.96 in 2017, 6.8pc higher than 2016. During 2017, the South West and Western Seaboard regions were the strongest performing areas, with average room rates for both rising to €100.67 and €87.49 respectively, a growth of 8pc in the South West and 9.7pc in the Western Seaboard area. 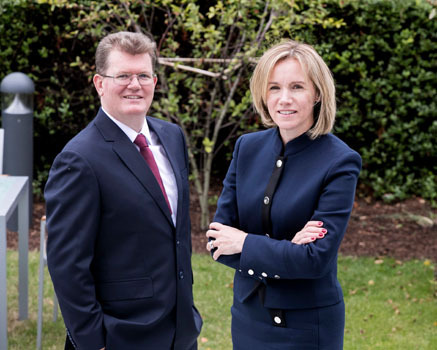 Aiden Murphy, Partner at Crowe, and Mairea Doyle-Balfe, Director, Hotel and Tourism Leisure at Crowe, at the launch of the latest hotel survey, July 31, 2018. Photo: Iain White/Fennell Photography. During 2017 average room rates in Dublin increased at half the rate achieved in 2016 even though only 237 new rooms were added during the year, according to the Fáilte Ireland hotel register. For the first time since 2011 average room rate growth in regions outside Dublin was higher than the capital, pointing to a broader, more balanced recovery. Occupancy levels across all regions have increased with all regions bar Midlands and East now reaching over 70pc occupancy. However, the Midlands and East are just shy of the 70pc mark at 69.5pc. Overall, the average room occupancy levels across all hotels are now at 75.4pc, an all-time high, while Dublin remains the area with highest occupancy levels at 83.5pc in 2017. At this level, every room in Dublin is occupied six nights every week, a performance metric which is considered very strong in the sector. Luxury hotels saw the biggest increase in room occupancy in 2017, with a 2.7 percentage point increase on 2016 figures. Their average room rate rose to €218.02, an increase of 6.2pc on last year’s record level of €205.24.